Shift-lab is a collective of five artists that collaborate regularly on projects but also maintain individual studio practices. The artists are Katie Baldwin from Huntsville, Alabama; Denise Bookwalter from Tallahassee, Florida; Sarah Bryant from Brighton, UK; Macy Chadwick from Oakland, California; and Tricia Treacy from North Carolina formed Shift-lab in 2013. 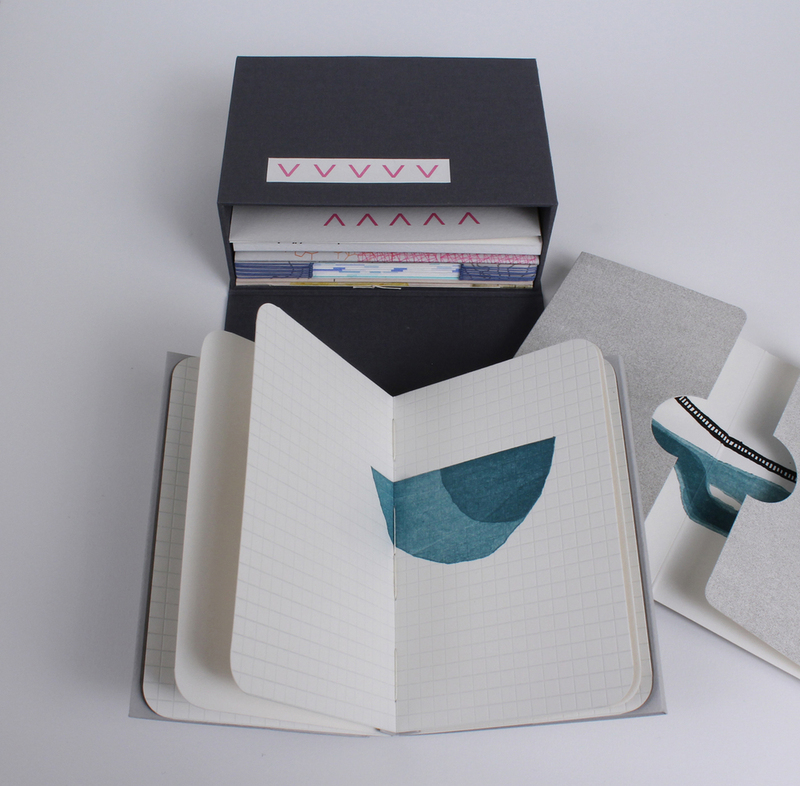 Shift, a set of artists books housed in a clamshell box. 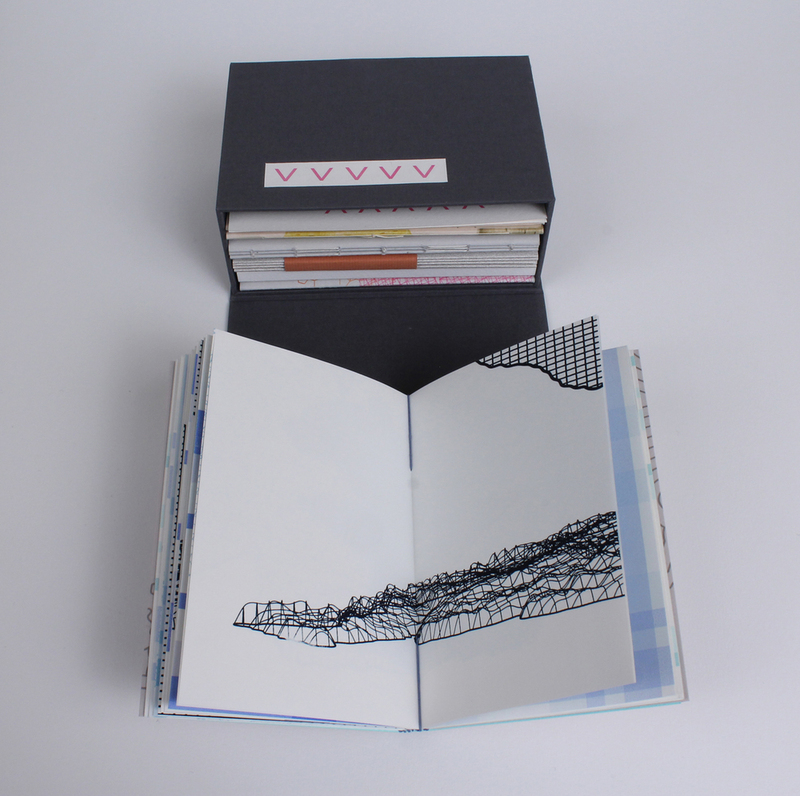 Each book was designed, printed and bound by members of the Shift-lab collective. Processes include: letterpress, woodblock, intaglio, and screenprinting. and rewritten from a new perspective." "For my interpretation of *shift*, I looked at the same conversation from two different perspectives within the same mind. The dos-a-dos book format contrasts the two views. A romanticized view of a conversation on one side is full of layers and colors, imaginings and illogical interpretations; an analytical view on the other side applies charts and graphs to bits of the same imagery in search of meaning." when read in different orientations, speaks about ways that"
plaids but shifts to valleys and peaks revealing its topography. visible only within the pages of the book." characters (glyphs) and grid systems into a visual story. was inspired by strike-through text, glyphs and music."